When Nursing Home Residents End Up in the ER | Hupy and Abraham, S.C. When your loved one goes into the care of a nursing home or other long-term care (LTC) facility, you expect the staff to provide the level of care they require. But when a serious injury or illness forces a nursing home to admit a resident to the hospital emergency room (ER), you may wonder whether it could have been prevented. It is never ideal for a resident to be hospitalized as they are especially vulnerable to the risks that accompany transitions of care, such as the potential for medication errors and hospital-acquired infections. Research has shown that nearly half of all nursing home residents will experience at least one ER visit per year. Additionally, a study in the journal Medical Care stated that three out of five hospitalizations from nursing homes could have been avoided. When these more serious incidents are allowed to occur, it is often due to the high levels of understaffing in many nursing homes, and other LTC facilities. Why Do Residents End Up in the ER? Abdominal pain – sometimes caused by infection, kidney stones or even malnutrition or dehydration. Anytime a resident experiences a change in their condition, staff is required to notify the resident’s primary doctor. But if staff does not properly evaluate residents, they may fail to notify the doctor. This is when many of the instances that land residents in the ER could be avoided, such as a head injury that results from an unsupervised fall. While visits to the ER are sometimes unavoidable, such as when a resident experiences a heart attack, in most other cases steps can been taken to prevent accidents, injuries or illnesses. 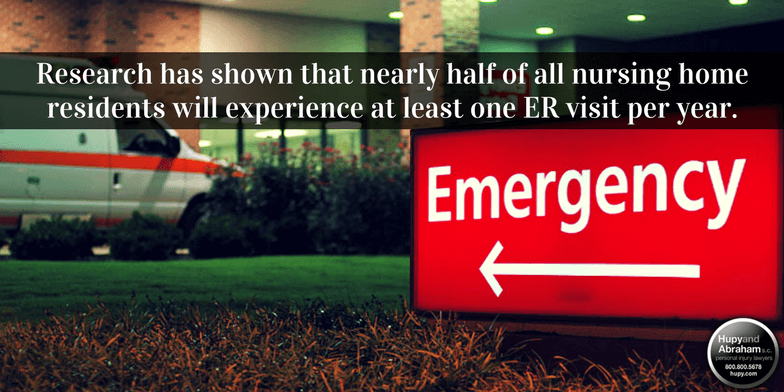 If residents routinely experience the above complications and require visits to the ER, this may be a sign of abuse or neglect within the facility. If you believe you or a loved one has been the victim of nursing home abuse or neglect, please view the resources available on our website, such as our free Guide for Nursing Home Abuse and Neglect Victims. To contact the experienced nursing home abuse and neglect attorneys at Hupy and Abraham, call 800-800-5678 or start a live chat 24/7 at Hupy.com.